A tiny but growing Maronite Community settled in the Chinatown of Boston around the year 1890. 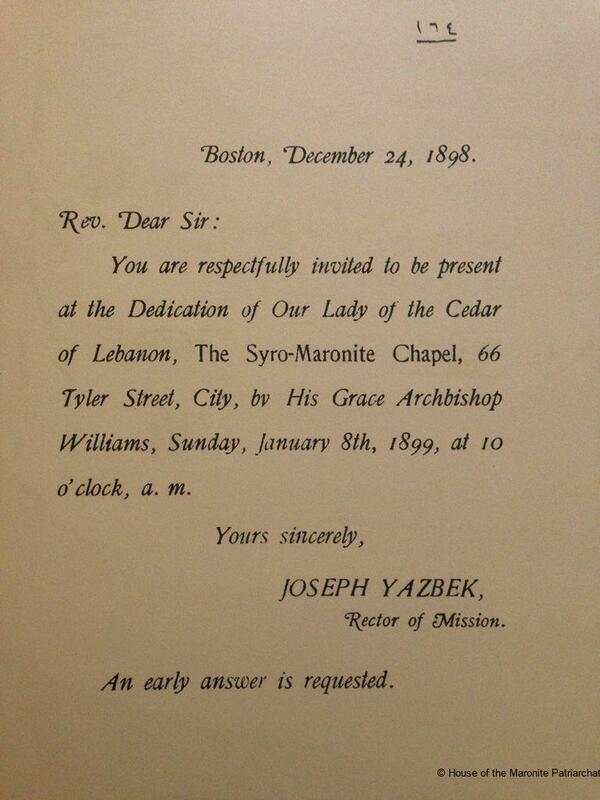 In 1893, the Roman Catholic Archbishop of Boston John Williams, realizing the spiritual needs of the Maronites assigned a priest (F. Gabriel Korkemaz) to serve the community of the city and state. Two years later, F. Stephan Korkemaz, a cousin took over and was succeeded shortly after by F. Joseph Yazbek. At the time, the hundred families that formed the Maronite community worshipped at St. James Church on Harrison Ave. Father Yazbek, rector of the Maronite mission in the USA, bought a 4 story building on Tyler Street, which he remodelled to include a chapel, a social hall and a priest’s residence. 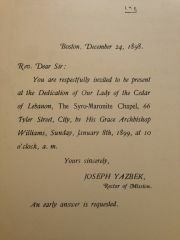 This letter is a copy of a letter sent by Father Yazbek to the Maronite Patriarch Yuhanna el-Hajj inviting him to the dedication of the Syro-Maronite chapel to Our Lady of the Cedar of Lebanon.